A New Facility Event, The Hunt for Harmony, Is Now Live! 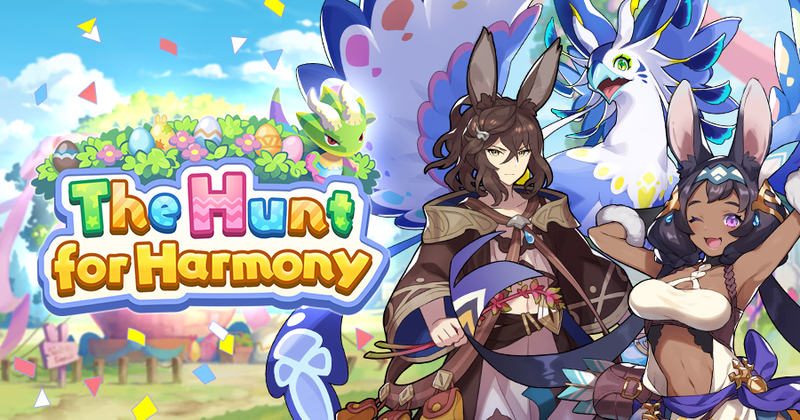 A new facility event, The Hunt for Harmony, went live 11:00 PM Mar 30, 2019(PT)/6:00 AM Mar 31, 2019(UTC)! It's time for the sylvans' Vernal Banquet, where Rabbit-eared people from far and wide gather to celebrate. The main event is an egg hunt, and whoever collects the most eggs is granted one wish. As the Prince, Sarisse, and Luca vie for the prize, Luca spots some familiar faces... It's his childhood friends, also competing in the egg hunt! Who will collect the most eggs and win the competition—and a wish? In The Hunt for Harmony, you can acquire an event-exclusive facility: a dragoñata. If you play the event, you’ll have the chance to build one for your Halidom! The dragoñata boosts the stats of water-attuned adventurers, which you’ll want to use in this event. It also boosts the damage that adventurers deal against enemies in event quests. Progress through the event story and level up your dragoñata. Adventurers can equip event-specific wyrmprints to receive more papier-mâché from these quests, which is used to upgrade the dragoñata. Wyrmprints are good for more than just that, though, so try to get a hold of them to get the most out of this event! Please note that special effects conferred by event-specific wyrmprints do not apply if you begin a quest during the event period but complete the quest after the event period has ended. Building the dragoñata in your Halidom increases the stats of water-attuned adventurers. The strength of this effect increases as you level up the dragoñata. You'll need papier-mâché to level up your dragoñata, which you can find in these event quests. You can get these from event quests related to the The Hunt for Harmony facility event. Boss Battles are quests where you can face off against boss enemies that appear in the event story. Rewards vary depending on the difficulty cleared. While the difficulty level is higher than the event Boss Battle on Expert difficulty, the rewards are generous and the battles do not cost stamina or getherwings. Extra Boss Battles occasionally appear after clearing the event Boss Battle on Expert difficulty. It will disappear again after being successfully cleared. Once the conditions for the quest are met, you can unlock it repeatedly. This quest can be played either solo or co-op. Challenge Battles are high-difficulty quests limited to solo play, and are available in Expert and Master difficulties. The Expert difficulty Challenge Battle is unlocked after completing the event boss battle on Expert difficulty, and the Master difficulty Challenge Battle will unlock when you complete the Expert difficulty Challenge Battle. This quest will have you testing your strength against waves of enemies. If you fail to reach the last wave, you will still receive rewards for the ones you did clear. Finally, the drop rate for rewards differs based on the difficulty. Eggsploration points are event-exclusive points which can be earned by clearing event quests. Collect them to earn all kinds of rewards! You can earn mushroom medleys and woodland herbs by playing event quests and trade them for various rewards on the Treasure Trade menu. What's more, in this event you'll be able to trade the various items acquired during the event for other items acquired during the event. These endeavors can only be attempted for the duration of the event. They are separated into Daily and Limited variations. By accomplishing these endeavors, you can receive various rewards. 1. You can see more details about this event by tapping Help on the event page. 2. Players must have completed up to Chapter 2 / 2-1 (Normal) of the main campaign to participate. 3. If the event ends while you are playing an event quest, the quest will continue until results have been determined and you will be able to gain the rewards shown.